This past Saturday Stephanie (aka 1/2 of "The Big Girl" duo) and I drove up to Ski Liberty for a quick 24 hours of tubing and skiing. The Big Girl and I hadn't been away together for a while, so I had looked forward to it all week. After gabbing the entire way up, we arrived at the 5-star Carrol Valley "Resort" (read: it is a dump) ready for action. We immediately grabbed dinner and some "beverages" at the tavern, had an in-room dance party in our long johns, and boarded the tubing bus. When we arrived at the tubing location it was 8:30 and the next available tubing session was not until 9:00. But here's the thing with the Big Girls. We don't just go places. We take them over. So we casually walked over towards the tubes, grabbed 2, and by 8:31 we were headed up the mountain. 2/3 of the way down our first run, we lost speed, stopped dead in the middle of track and wondered what was wrong with us that we couldn't make it to the bottom. We quickly learned we were in the middle of the kiddie lane, generally reserved for 2 to 4 year olds. 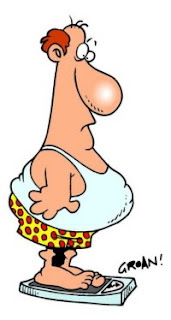 Now, while we may be very fit (ha), we do carry a little more poundage than your average toddler. So once we got in line with the adults, the rest of our runs flew by at lightening speed. On the way back to our hotel room, we stopped at the restaurant to buy a small snack only to find out that there was a $10 minimum to use a credit card. Now, this may have deterred another duo. But (you guessed it) not us. We left with 2 oatmeal raison cookies, peanut M&Ms, cheese crackers and 3 waters, and watched the Olympics in bed like little fat girls. The next morning we awoke bright and early, got some breakfast and hit the slopes. We skied as many runs as we could before the sun turned the snow into a mixture of slush and glue. For old time sake and to relive our childhood, we even ended the day skiing down our all time favorite green, Dipsy Doodle. We have plans to take over west-coast skiing one weekend next winter. But until then, Ski Liberty did just the trick. Four weeks ago, my friends Nina, Beth and I launched a Biggest Loser competition at our school. We wanted to encourage people at our school to get moving after the holiday break, and what better way to do it than an all out, cut-throat competition? We are competing on a basis of percentage of weight lost, and to sign up we each chipped in $25.00. We got so many people to sign up that the BIGGEST LOSER is going to win SEVEN HUNDRED DOLLARS. Now I don't know about you, but I'll STARVE myself for $700.00!! My strategy is much like Apolo Ohno's when it comes to winning gold in men's speed skating: hang in the back of the pack and look unassuming until crunch time, then swoop in for the kill. At least this is the plan I'm banking on considering I've only lost 1 pound HA! It only took a few days for the competition to turn ugly. 2 days after we started, I delivered an ice cream sundae to my teammate Nina. Since then one of our friends has brought in donuts for breakfast, and one walked around with Starbucks pastries. Just today Nina had her student walk over and offer me a tray of cupcakes that were oozing chocolate. NICE TRY SUCKA!! Regardless of how this turns out (Carrie- you better watch your back) I am just happy to get people up and moving until Spring Break. The camaraderie in the hallways and laughter throughout the weigh-ins has been awesome. And the new Louis Vuitton I'm going to buy with my winnings won't be too shabby either :). My School Mom, Whit & T-Money! I'd like to give a shout out to 3 birthday girls today. First, how many of you can say that you have a coworker who will stand on a chair and cook you breakfast on a griddle at 8:00 in the morning? Well, meet Jane :). 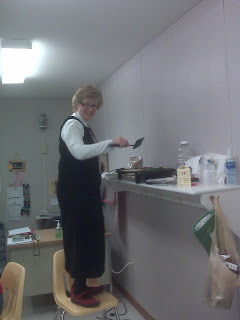 Jane is my teammate, and this is a picture of her at a 3rd grade team meeting a few weeks ago making us omelets, turkey bacon, and asparagus. I call Jane my "School Mom" because she took me under her wing my very first day of work (and by that I mean the first thing she did was take me to the book room to steal books for my classroom library) and we have been the greatest of friends ever since. She listens to me, she cracks me up, and she makes me a better teacher. It's a great feeling to work in an environment where people always have my back. So Jane, for that and a million other things, 10+. Today is also my cousin Tara's birthday! While Tara and I are in fact "cousins", my extended family is so close that in my head we are friends first and cousins second. If I could describe Tara with 1 word it would be hysterical. Her imitations are genius, she has a laugh that makes you wonder if she's gasping for air (which, by the way, perfectly matches her mother's :) ), and she can whip out a harlem shake and step routine that would make Channing Tatum jealous. She is beautiful and smart and INCREDIBLY loving. So here's to you, T- I know it's going to be an awesome year! Cupid's a Fine Fellow Indeed! The Big Kat, Big Mama, Chris and I spent our third annual Valentines Day together this past weekend! We headed to Gettysburg, PA on Saturday and arrived in time to explore the town and eat lunch. That night we found a bowling alley (surprise! ), where I bowled an impressive 47 (unfortunately I'm serious) and returned to the Dobbin House Tavern, where Chris and I had eaten on our getaway a few weeks before. We were greeted with roses and seated at a booth that looked like an old-time canopy bed (so cool!). About mid-way through our meal a man in knickers serenaded us with a celtic song, and then, upon asking the ladies our names, made up a song entitled, and I'm not joking here, "Gentle Jessica and Flower Peggi". Before I knew it, my dad (whose voice is better suited for I Got Friends in Low Places than Flower Peggi, and Chris (whose singing repertoire consists of imitating Bing Crosby in the Christmas classic Silver Bells) started singing along. Those of you who know these two, please stop and imagine this for a moment. By the end of the tune, I was literally laughing so hard that I had a stomachache and tears streaming down my face. The next morning we awoke bright and early to find that my dad had already gone downstairs to the hotel lobby to find coffee. Now, this is a man who thinks you "ring in" to the internet (read: sign on) so you're just happy when he returns in one piece. We ate a wonderful Valentine brunch at the Lincoln Diner (a favorite of ours from years ago) and walked through a Civil War museum. Then we got in the car and drove to Ski Liberty for a little TUBING! The Big Kat, Chris and I flew down the mountain at lightening speed while Big Mama, more comfortable with both feet on the ground, relaxed in the lodge. Despite the Big Kat's version of "snow gear" (a camouflage hunting one piece) he looked like a true pro out there and I was SO HAPPY that we got to do that together. I even tied my tube to his for a run and screamed in his ear all the way down the mountain. All in all the trip was a total success. Cupid sure was good to us this Valentines Day. Chris, the Big Kat, Flower Peggi, and I, Gentle Jessica, had a really wonderful time. So! I have a running joke with my friend Katie's dad. He gives me a hard time about the amount of traveling I do, and in return, I rub it in his face:). (Mike- the recent trip to Cancun was AWESOME). Anyway, at the end of 2009 he told Katie that he was going to keep a secret "Jessica Travel Calendar" on his desk at work. He wanted to mark off how many days 0f 2010 I don't sleep in my own bed and give it to me at the end of the year (hilarious, right?!) So I got to thinking... maybe I'll just make it easier on him and record my 2010 travels here! This way I will always remember my adventures, and at the same time I can make Mike really jealous (the whole reason I travel anyway). And if I can give someone a great idea for a trip (you deserve it! TAKE ONE!) or a little R&R while I'm at it, that would make my day. So buckle your seat belts and dance, dance, dance. We only get this one, awesome life to squeeze it all in. What are you going to do to make today memorable? I rang in the New Year at Schooner's Wharf in Key West, Florida with Chris, my mom and Jason. I actually arrived in Florida on 12.29, but that was so 2009. So it's not in the running. As I already wrote, we had a fantastic time. We watched the last sunset of the year from a rooftop deck, ate crepes at our favorite Croissants de France (think nutella, bananas, and peanut butter in a crepe topped with vanilla ice cream OMG), and counted down to 2010 right on the water. It was a great way to start the year. I took the VRA (Virginia Reading Assessment) that Saturday morning, and I cried all the way home from taking the exam. I knew I failed. Was sure I failed. And did I mention I had procrastinated on taking the exam for so long that I had ONE chance to pass before the deadline, and if I failed I would lose my job? Well, no sense in crying over a little spilled milk (or my CAREER)! I headed to Baltimore for some much needed Katie time. As soon as I arrived I stopped thinking about what I'd do if I lost my job, and she cheered me right up. The next day I got back from Baltimore (having made a wonderful mid-morning detour to Columbia, MD for my friend Sabrina's sister's baby shower) and repacked my suitcase and headed to Gettysburg, PA with Chris for the rest of the long weekend. That night we had dinner at The Dobbin House Tavern, where we ate sitting in 2 lazy boys by the fire (phenomenal). The next day we had a great time skiing @ Ski Liberty, and by "great time" I mean I had fun and Chris did his version of the "pie" and skied backwards half way down the mountain. For Christmas, Chris gave me a trip to Cancun for the end of January. It worked out perfectly, because unbeknownst to him, he had planned it over teacher workdays so I only had to miss one day with my students. We had both been really busy at work so the opportunity to get away together meant a lot. The second we arrived at Le Meridan hotel, we went into relaxation mode, and relax is all we did for 6 straight days. We ate, we laid by the pool, we walked on the beach, we laid by the pool, we talked for hours, we read, and we laid by the pool. It was FANTASTIC. In the hotel business center, I even came across a treasure of a book, called Nineteen Minutes by Jody Piccoult. Read it. She hooks you on page 1 and you'll never look back. Mexico is a fail-proof vacation destination. It's always warm, and waking up to the sound of crashing waves isn't too shabby either. We arrived home from 80 degree weather only to find out that Virginia was expecting a 2-3 ft. blizzard that Friday, the day my friend Rosemary was supposed to come visit me from New York City. Ro is moving to Australia at the end of the month to earn her PhD, and her trip here was going to be our last hurrah for a while. On Thursday night I found out 2 things: school was cancelled on Friday (aka no work for me) and Ro had had to cancel her train ticket down here (big bummer). Where was it NOT going to snow 3 feet over the weekend you ask? New York City. So there I went. If Ro couldn't get to me I was going to go to her. And my mom was headed there anyway to see Jason in a show, so someone had to keep her company, right? Ho Ho Ho and Happy New Year! In the weeks between Thanksgiving and the start of 2010, I did so many wonderful things that I'll always want to remember. I know it's a little late, but I'm snowbound inside my house and finally have some time! - I went to NYC w/my mom and Chris to see Jason in a show. While we were there we also saw Up in the Air, had hot chocolate at a Viennese cafe in The Plaza hotel (so Jason and I could reminisce about our time in Vienna!) and my friend Ro came down from NJ and finally met Chris! - My mom, Jason and I went to see the ICE sculptures on the National Harbor. I made Jason hold my purse so I could take pictures and consequently, in every shot, he's holding a Louis Vuitton. I am laughing out loud right now thinking about it. -The entire Robinson and Wood families had an unforgettable Christmas Eve (Let's hear it for Big Mama!) where, thanks to modern day technology, we even got to watch Jack "talk" to Santa Claus at the North Pole! - Last, but CERTAINLY, not least, Big Mama, Jason, Chris and I went to Key West, Fl for a little R&R and rang in the New Year at Schooner's Wharf! Looking forward to a 2010 full of as many wonderful memories!